Mafia made its debut on GOG.com on October 20th, 2017 [Archive] and returned to Steam on November 21st, 2017. Reviews and forum discussions about the re-release have confirmed that all of the licensed, 1920’s era songs were removed from the game, leaving only the original score intact. 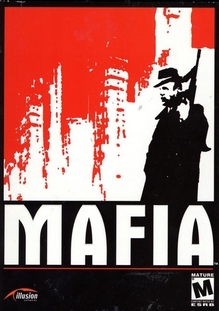 Mafia was delisted from Steam on or very near October 7th, 2012. The last active Archive.org capture shows it available on September 29th and removed as of October 15th, 2012. According to Steam Community posts codes remained available and active from Amazon through the end of 2012. Pages for the game have since been removed from digital reseller sites like GamersGate. The popular opinion is that it was delisted for “licensing reasons” related to the game’s music but the culprit may be the single track “Lake of Fire” by Lordz of Brooklyn. The song was originally created with the help of House of Pain frontman, Everlast, but was remixed twice by Lord Finesse with new lyrics added by both Oc and Lordz of Brooklyn. The version that plays during the end credits in the game is licensed through Tunnel Vision Media which appears to no longer exist. Given the complexity of the song’s heritage it seems that 2K was either unwilling or unable to re-license it or justify the work to remove it from the game. Physical copies of the PC game remain available from online retailers, as do the Xbox and PlayStation 2 versions. In a similar licensing snafu, the digital versions of Mafia II were also delisted. 2K Games spent 9 months making unconfirmed changes to the game before re-releasing it on Steam on June 1, 2016. Users have since confirmed that at least some music tracks from the original version were removed. In late August and early September the Xbox 360 and PlayStation 3 versions of the game were also put back on sale. The game eventually made its debut on the GOG.com platform on March 30th, 2018. See our Mafia II page for more information. 20 action packed missions with subquests: mob hits, car chases, shootouts and more. Complete the unsavory tasks the Family needs done and you will be handsomely rewarded. Explore over 12 square miles of the 1930`s American city, with simulated traffic, landmarks and surrounding landscapes. Convincing environments pull you into the 1930`s, with their attention to detail and style. Seedy bars and hotel rooms to train stations and dockyards – Every location is rendered in fantastic detail including the Lost Heaven International Airport and China Town. Use an incredible array of weapons, such as the Tommy gun, Colt 1911, S&W model 27 MAGNUM, or pump action shotgun. Drive over 60 different vehicles with most realistic car physics ever made for an interactive game. Multi-player support for up to 16 players via LAN or over the Internet. Seven multiplayer modes to choose from – including Death-match, Capture the flag and more!